But that's just it, what exactly are they rebuilding? That has never been made clear. I don't see any physical removal of tracks or signals along the line. How can replacing a computer system really take more than a few months when all of the basic infrastructure is already in place? If it is that time consuming, they probably should shut down the system 24/7 rather than simply M-F until further notice. I thought the original system opened in 1993? The system opened in May 1993. When did construction begin? 1991? It's government work, so you're looking at years of planning, design, and development by agencies trying to win the bid -- that's taking place in what? 1989-1990, maybe 1988? What are they using to base their design and operations? 1980s technology which may, at that point, have been even older than that. It's more than just "get on the tracks and go system." It's communications-based-signal control systems, throughout the whole line, and the system beyond. Every inch of the operation has to be in agreement with every other inch of the operation, and in agreement with the operating equipment, especially when using driverless automated systems. Every stop and every acceleration of every train car on that line has to receive the "ok" from the rest of the system so the cars are spaced and don't crash into each other. It's much more complicated than you think. You should be thankful it's only taking a year and a half. It's probably going to be a 30-40 year project, in total, if not 50, for New York City and the PATH to bring their entire system up to date with a similar system. This schedule is a disappointment, but on the bright side, on my first international to domestic transfer with the bus a couple of days ago, the system went actually quite smoothly. There was no waiting; the people involved all hustled, and I was in Terminal 2 as fast as I would have been on the ATS, maybe quicker (admittedly, I arrived before noon on a weekday, so a fairly quiet time for a transfer). I have been considering arranging my next International itinerary to arrive O'Hare on a weekend to take advantage of the ATS operating, but now I feel the bus during the week is less of a factor. I am wondering, however, how long the weekend ATS service will continue; seems like eventually the'll have to completely shut it down, considering the info above from stigph. A sign of continuing progress on O'Hare's next new runway: in an email from a couple of days ago, the Chicago Department of Aviation issued a bid opportunity entitled Addendum #1 - Runway 9C-27C Bid Package #3 & Runway 4L-22R Rehabilitation, with an opening date of November 20. "The scope of work associated with the construction of the Runway 9C-27C Bid Package #3 & Runway 4L-22R Rehabilitation Project includes, but is not limited to, the following items: All work for the construction of a portion of Runway 9C-27C, rehabilitation of Runway 4L-22R, associated Taxiways, and rehabilitation of the North Airfield Lighting Control Vault. Work Elements include, pavement demolition, utility demolition, earthwork, grading, paving, drainage, utilities, airfield lighting, common electrical duct bank, vault electrical, FAA approach lighting, pavement marking, and fencing..."
Sounds like the shut downs during the week may be sufficient enough to get it done. As someone who has spent a few years living in NYC and seeing the complete mess such work is causing now and will cause in the future - all I can say is kudos to the ORD folks for getting it done now and getting it done in what seems to be a reasonable window given the scope of the work. Didn’t TP announce ORD starting in 2020 or something like that? "The 10 North American destinations that TAP aims to have in the near future are mostly known; the 5 existing: MIA, EWR, JFK, BOS and YYZ, plus the other 5 discussed many times: SFO, ORD, IAD, YUL (all all planned for 2019) and LAX (2020?)." I trust this info and expect to see an announcement from TAP in due time, but who knows; things can change. At the risk of repeating myself... I am in total agreement with you on this one, muralir. No more bleached turkey carcasses please! If only Saarinen was still alive. He was and will always be the best in my opinion. Father or son? Eliel or Eero? "Beginning January 8, 2019, the schedule will move to full system closures to allow for safety testing and other requisite commissioning activities before the new system opens." It could be made a bit clearer, IMO, but I'm reading it as from that date there will be no more weekend operation of the ATS until the reopening sometime in the fall of 2019. November 20 through the 26th. December 21 through January 7. All other dates require bus transfers. I know he has that reputation, but he is also extremely-decorated and accomplished. If you look at his portfolio over the last 3 decades, I think it's fair to say his designs age incredibly well, with some of his projects from the 90's and early 2000's looking like they came out tomorrow. He is innovative and yes some builders are challenged by that. For ORD, building a new terminal complex for the next 50 years... I'd say the city can afford to risk a few delays (as they have already) if he comes up with something epic. Again, this a competition.... I might like something else once the final renders are released. Overall, don't think ORD can lose with these finalists. I haven't used the new MMF yet, but my friend said the bus transfer was pretty easy and fast recently - "painless" is the exact phrase he called it. Maybe that changes in January or February, lol. AV starts BOG on Saturday and NZ is just over two weeks away! O’hare is bringing th Christmas decorations out! My favorite time of year to walk through the terminals. And also, we’ve alluded to it in this thread before, but T3 always seems to have the best Holiday decorations with T1 not typically having as much. Well, this year, T1 has some very nice lighting being put up from the looks of it. Does anyone know what type of construction is going on at the Des Plaines Oasis? Looks like some concrete support columns are getting poured between the northbound & southbound lanes. It seems bigger than signage-related to my eye. Would be great if it was a new pavilion/bridge over the highway like it used be, and formerly like O'hare oasis. I'm crossing my fingers. O’hare is an absolute nightmare today. The line to get on the buses from T5 over to T1/2/3 is about 3 hours long. People are having to pay for taxi cabs over to the domestic terminals just to make their connections,. AA adding summer YQB, GCM, and PLS flights. Also 3 of the 4 LHR flights will be 789 in summer. 3 hours! ugh. I hope this is not a sign of thing to come for the Holiday Season just ahead. If so, its going to be a hard one for those international<>domestic travelers at O'Hare. They are beginning to build the O'Hare West Bypass (I-490) interchange, which will wrap around the west side of ORD and eventually provide for western access. Awesome, thanks for sharing! First time I have seen that document. Based off where the columns I see going up on I-90, it looks like they might be going with Option E. Again, I would've thought options A, B, or C would have made more sense, as I noted above, lol. But hey, I'm not an expert. Page 149 is super interesting: I can't imagine how different that part of 294 is going to look if this eventually comes to fruition. I think Option F looks to be the least disruptive to the industrial complex on the south-side of the airfield. I am pulling for that one. I think it is alternative 203 option D, see page 162. Plus it matches up with the construction IDOT is doing on the I-294. AV82 departs BOG 12:35 hrs and arrives ORD 18:15, a 6'40" flight operated with an A-319. AV83 depart ORD 22:00 hrs and arrives BOG 5:15 +1 after a 6'15" flight. These flights are currently scheduled to operate Mon/Wed/Fri/Sat. Bingo...there it is, you got it. Thanks for all the links. This will necessitate the closure off the Des Plaines oasis altogether, not a flyover (which I thought did not make sense). I really do think IDOT should look rebuilding both the Des Plaines and O'hare Oasis after all this construction. Seems like a giant missed revenue opportunity if they don't. "Closure and removal of the 7 Eleven fuel stations at the Des Plaines Oasis will be scheduled in early 2019." I noticed the schedule for EY 150 ORD-AUH switched to the evening bank of departures, joining the other ME carriers. Is this a seasonal change? That's quite a long time for a 77W to sit idle compared to before. What's their reasoning for doing this? They also now arrive in the afternoon as well. So now that the CONRAC is open, what is becoming of the old rental car lots? I believe UA employee parking moved to part of them. The rest is being opened as remote parking. I think that eventually a new long-term parking facility will be built on them, likely multiple decks that connects to the existing ATS station there. 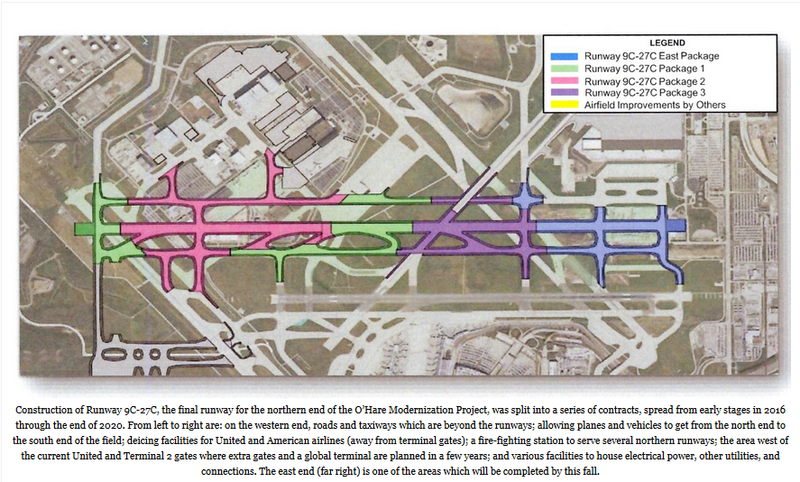 ORD lost a lot of owned long-term parking capacity by building over the economy lot East of Mannheim with the CONRAC. They could gain that back by building a deck attached to the Remote Parking ATS station. This would almost eliminate the need for Airport-operated shuttle buses. This was the schedule they used when they first started ORD service. They were the first ME carrier here (not counting Royal Jordanian who has served ORD since the early 80s) and changed to the am arrival and early afternoon departure after the other 2 came. I don’t know if the current change has to do with the weakened relationship between AA and EY or not but I saw that the change isn’t seasonal. They probably won’t be able to do any decking due to the arrivals over 27L and the soon to be 27C. The FAA can be very picky about that. Short-term, of course, nobody knows, since CDA doesn't believe in communication. But the TAP says virtually all (airline and airport) employee parking will be at the new western entrance. There will be secure screening facilities there, and bus stops built into all of the new terminal/concourse construction. I can say that I have not seen any plans or authorization for new permanent construction of any kind (except for obvious airfield work) south of the NE cargo area on either side of Bessie Coleman, and the deck would be impossible since it falls within the approach/restricted height zones for 9C-27C. Since the parking levels of the MMF only provide about a quarter of the surface lot spaces in E, G and H, they obviously stay in place FTTB. But the MMF is designed to take another 4 stories upward, which would provide within 700-800 of the number of spaces originally started with in all legacy surface lots E/F/G/H. East package complete; Package 1 completes next month; final bids for Package 3 are due this week, and the entire project is on schedule for 15 October 2020 completion, according to the article (which also talks briefly about some of the AA, UA and airport facilities being moved). So, simple math (March 15, 2019 + 455 days + winter suspension of approx 90 days) means we should be in punchlist by September 30, 2020 -- and only 30 days are allocated for punchlist work. Frankly, I was surprised; these are pretty severe terms the city put in the bids. If they hold contractors to this (new administration and everything), they might get O'Hare 21 off to a good start. Nice sleuthing, chidino! This info helps to get some perspective. Interesting that the runway information comes from a suburban paper and not the Tribune or Sun Times; you'd think they'd be all over these developments. "The airport is adding a centralized deicing facility... To coordinate operations as planes are set to be deiced, a ramp tower is being built this year to keep track of aircraft moving in and out of the deicing area. It will be due to finish by the end of 2018." Will keep my eyes peeled for this structure's rise. Anyone seen evidence of it on the field? What dynamic changed that allowed ORD to expand like this. In the 70s,80s and 90s the affluent suburbs around the airport kept any growth from happening. What changed? My understanding is the super restrictive lease agreement between the airport and UA/AA that was signed in the early 80s expired. These improvements should have been done two decades ago, but the lease agreement gave UA/AA too much control over capital projects (I believe I heard somewhere it was the most exclusive and restrictive lease agreement in the country), so they vetoed pretty much everything, which allowed ORD to decline and lose ground. That’s my understanding, maybe someone else can explain it better. That's my understanding as well. So, just to add, UA/AA vetoed expansions because (1) if it benefited other airlines, it could damage them, so they vetoed, and (2) UA/AA basically had to both want similar growths to do an expansion for themselves (UA is not going to let AA get 10 gets and UA only gets 5, etc.). Thank you chidino for all of the information. This bid package looks like it just the site/civil package. What is odd, if you goto the drawings at the end, they don't even show an outline of the proposed structure. The works doesn't even include the paving around where the T5 expansion is going to be. I think this is just infrastructure work to get the site and surrounding areas ready but not part of the actual expansion yet. My guess is this has more to do with their current financial situation. Right now they are showing only 1xDaily at JFK for eg.,. They are consolidating all their USA departures to arrive in AUH around 7:00/8:00 PM time frame which dovetails nicely into their Indian sub-continent bank at 10:30 PM. Which is frankly the best time to fill a plane to that region. They have what only 3 stations in the US now? ORD, JFK, LAX? Doesn't make sense for ORD to reach AUH in the afternoon. I think that's the rationale. Also with the reduced volume from the US, it will be more financially sensible to have the TSA pre-clearance run for 1 small period of time. AS I understand it, that was a bottle neck at AUH and that was the primary reason to switch some flights to afternoon US departure. That was my initial reaction as well, but Carole Brown (City's finance director) just stated to investors at the roadshow that DL would be in T5 1Q 2021. Since she also stated they don't move until the expansion is done, I tried to figure out if this is whole the T5 package. (I'm obviously no contractor and don't have the bid package itself; it's only available in hard copy/disc to bidders.) The questions on the addendum seem to be random follow-ups by bidders about certain details regarding site work; it's interesting that whole sections of the bid package did not get follow-ups, but some sections had many (I'm thinking that's maybe due to different sources for the bid specs.) Again, I have no hard proof, but unless Carole just lied to the investors, the whole package and the schedule referenced in this addendum has to be T5 expansion. If it's just site prep... sheesh, they're years late already. Yes, yes and yes (basically). The Byrne administration had no idea what they were doing, and thought the redevelopment of Ts 1 and 3 and the agreement for an International Terminal and ATS was a huge step forward. It was, but didn't require 35-year (!!!) leases. As a result, AA and UA had veto power over other carriers (effectively) as well as contractual control of their gates. (I don't know how old everybody is, but DL tried to establish a mini-hub here in the 80's -- they paid for Concourse L -- but the competition was brutal and they headed for CVG.) And AA and UA spent most of their time sniping at each other, rather than improving much. It's been a long wait. So the NIMBYs in the surrounding neighborhoods had nothing to do with ORD stagnant growth? They really had most to do with the runway expansion... not adding gates. They're concerned about noise and more planes.